Many people use iPod’s. If you are looking for a freeware to manage your iPod then you can try YamiPod – Yet Another iPod Manager. YamiPod is a free utility to manage your iPod without using iTunes. The latest version of YamiPod supports iPod classic and Nano 3G. 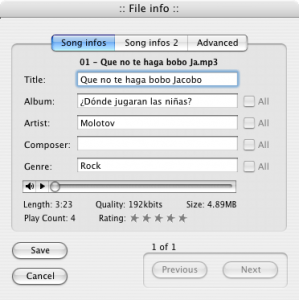 With YamiPod you can easily transfer your MP3 and AAC files from your iPod to your computer and vice-versa. YamiPod requires no installation and you can run it directly from your iPod. The best thing you will like about YamiPod is that it requires no installation. You can read and write MP3 ID’s and AAC Info’s. YamiPod supports Playlists(M3U, PLS) Import and Export. YamiPod has also got a built-in music player. With the help of YamiPod you can delete duplicate music tracks and you can also find lost tracks. Simple and easy to use PC to iPod synchronization. You can also upload RSS and Podcasts to your iPod. You can also export Play lists to HTML.